Thrill of the Taxa is a series where everyone's favorite hunter/behavioral ecologist Aukatos is going over hunter pets from a biological lens. We'll be working our way through some of the loosely defined phylum and classes of tamable hunter pets (and non-tamable hunter pets); last week he covered mammals, and this week Aukatos delves into invertebrates. Who says they lack backbone? If you are still reading from the first post in this series, you’ll recall that I tossed out a statistic in the first sentence, specifically that of the 8-14 million species that reside on the planet, only about 55,000 of them are vertebrates; that leaves the rest for the invertebrates, or animals without bones. There’s a little bit of clarification to get out of the way. First, the way scientists classify all living organisms is broken down into a hierarchical scheme called taxonomy, with each higher levels encompassing more and more of life, and lower levels becoming very specific. When I say vertebrates, you could take it literally to mean anything with bones, but what really separates them is a little wider. For example, there are some vertebrates without a proper backbone, namely hagfish. However, what hagfish do have is a notochord (spinal cord) which runs through the backbone of all vertebrates, and is something that all invertebrates lack. Some other distinctions can only be seen in embryonic development of many of the animals that come to mind today. For example, all humans have a tail for a brief time as an embryo. Fun! Now that we’ve got a separation between vertebrates and invertebrates out of the way, let’s turn our lens more closely to the topic today. 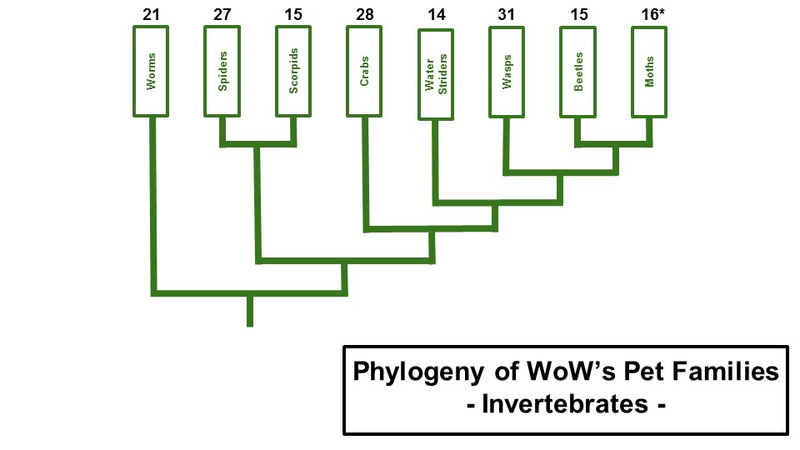 Out of all the invertebrates that make up the vast majority of life on earth, the diversity in WoW represented by tameable pets are comprised almost entirely of one portion of invertebrates known as the arthropods. Arthropods are what most people think of as “bugs”, but it also encompasses everything from arachnids to crustaceans. Aside from arthropods, the only other family of inverts that WoW features are the worms, which most likely belong to the phylum Annelida (think earthworms vs flatworms). In WoW wasps have the highest species abundance (different models/skins), followed by spiders, then crabs. IRL, beetles take the prize for the most species in one Order. That’s not just invertebrate Order, but ANY animal Order. It’s true! Creepy-crawly beetles make up about a quarter of all animal species on the planet, and comprise almost half of insects!! I mean, few hunters have been interested in battle beetles since Ahn'Qiraj, but the scarcity still nags at me. Figure 1. 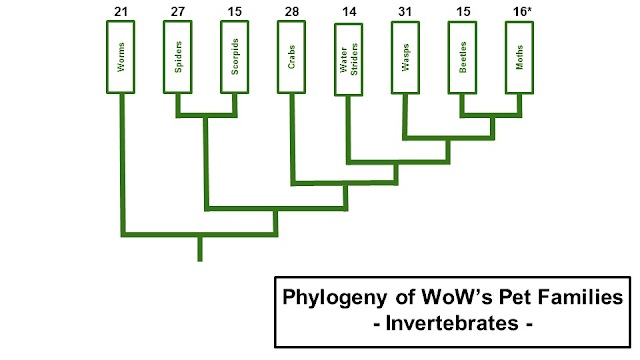 A phylogeny of Wow’s invertebrates by in-game family. Numbers above each family represent the number of unique looks (species) within that family. Moths are the only pet family tameable at multiple life stages in WoW. Yeah, sure, mammals have radiated far and wide, but inverts have done a pretty bang-up job considering they can’t internally regulate their body temperature. Inhabiting every continent, even Antarctica, arthropods can be found in the air, on the land, underground, and underwater. High reproductive effort coupled with a high tolerance for temperature variation are just a couple of the reasons many inverts have radiated to fill almost every niche on the planet. This ability to occupy unused space, and exploit available resources therein, is just another reason for the success of our spineless friends. Like the preceding article on mammals, we run into a problem. Invertebrates are so diverse in form and function it’s impossible to make generalizations about them all, so I’ll again be choosing a few specific taxa for discussion below. Spiders are found on every continent save Antartica, and thrive in both urban and natural environments. If there’s prey to catch, spiders can almost assuredly be found spinning their webs close by. Spiders can tolerate both heat and drought, as well as an excess of water or (temporary) extreme cold. Some spiders can survive a partial freezing of their body! 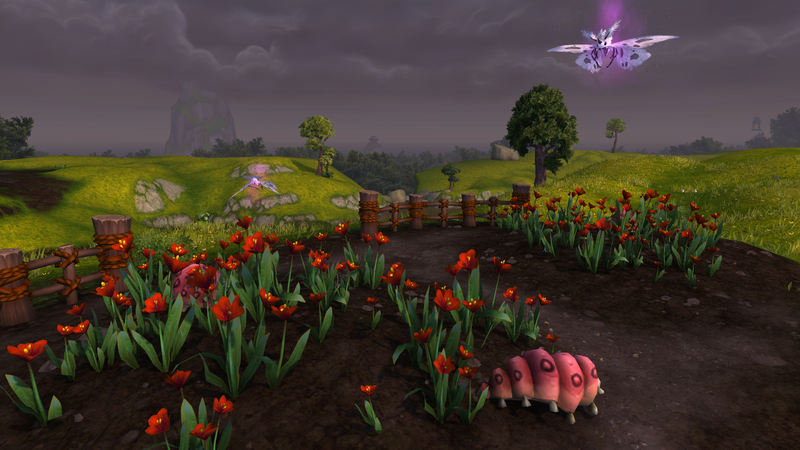 If you want a spider-free zone in WoW, you’d need to look to Winterspring, or perhaps Storm Peaks or Icecrown. Above I said that inverts had evolved to fill almost every available niche in the environments they inhabit. For example, you’ll find arthropods in all manner of places, from decomposing organic matter at the forest floor to eating living plants in the canopy. You’ll find them eating other animals too, from mammals, to fish, to birds, to themselves. In-game, the only real recollection I have of seeing inverts preying on other animals is in the form the well-used quest trope: free *insert NPC here* from the spider webs! We don’t have any real direct interactions like we see in the cats or wolves, where they actually chase down their prey. How cool would it be to see a critter walk into a spider web, get caught, then a spider come down and grab it!? Eh? Maybe it’s just me. When it comes to social interactions, insects have some of the best studied social systems in the world. Blizzard has played on this, heavily at times and more subtly at others. On one extreme, take Ahn’Qiraj or the Nerubian Empire. These anthropomorphic arthropods have constructed vast hives and cities that clearly plays on the sociality of insects. While elsewhere, perhaps in the Jade Forest, you might run into a hive surrounded by Orchid Wasps or Honeykeeper much like would in real life. There’s something unique to the invert pet families that isn’t found anywhere else in WoW. You are able to tame the same “species” at multiple life stages, as different pet families! The Silkworms of Pandaria are simply the larvae of the moths they pupate into! In real life, the domestic species is Bombyx mori, and at least the adult moth resemblance is clear in-game. Figure 2. The silkworm, Bombyx mori, as cultivated by the Pandaren, and its adult counterpart. In the Valley of the Four Winds, both Silkworm and Silkmoth were mutated and ill-tempered (no laser beams attached to the heads though). Figure 3. WTB Tamable Waterbears! What pet do you want by your side in a raid? How about something that you can freeze, boil, drown, dehydrate, irradiate, and throw into the vacuum of space and it still comes out swinging? Look no further than the nigh-indestructible Tardigrade, also known as the water bear. These basically microscopic creatures have all the above on their resume, not to mention a few hundred-million years’ experience on earth. 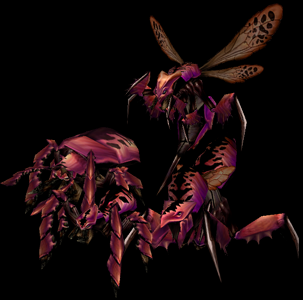 In a perfect world, the flying families probably wouldn’t bite as a first method of attack; instead, they need a sting ability, which is currently only available to Scorpids. Though overall, the Bite ability is fairly accurate for most invertebrates. You can really tell that the developers at Blizzard played on the exoskeleton aspect of invertebrates. Beetles have Harden Carapace, Crabs have Harden Shell, Ravagers have Chitinous Armor, etc. In real life, these insects can’t actively harden their exoskeletons, but I get the feeling they’re going for here. Still, it would be nice if they could branch out a little and give the families a smidge more thought. After all, you can’t judge a beetle by its cover. Scorpions, the real-world version of the in game Scorpids, can only consume a liquid diet; the venom they inject into their prey allows the insides to be turned into liquid that can then be sucked out. We can assume that in game, if you use feed pet on a scorpid to feed them meet of some kind, they must be liquifying it before eating. The good news is, for those of you who haven't used your Feed Pet ability since pet happiness was removed in Cataclysm, some Scorpions can go up to a year without feeding. Silithids, Sporebats, and Shale Spiders. Oh my! While it’s easy to say that Silithids or Ravagers are most likely invertebrates, they’re clearly invented by Blizzard and don’t have a perfect, or most likely even intended, analog in real life. However, one reason I’m not more upset about Beetle diversity in-game is because it wouldn’t be a great stretch of the imagination to see something like Silithids as close relatives to beetles. Shale spiders are clearly elemental beings. Despite the “spider” nomenclature, they only have four legs and don’t seem to spin webs, nor do they have venom. Maybe I missed some lore somewhere? Again, can't tell you how much I'm enjoying these posts. I think part of the reason that beetles are relatively uncommon as pets in WoW is that shell shield isn't much needed at the moment. Unless you are doing some cutting-edge soloing, you just don't need it or even need a tenacity pet. In Legion, where pet buffs won't matter, I'll probably run with stables of all-cats or all-bugs. I'm a cat person to my core and also a lay-entomologist trapped in the body of a PR attorney!